Samples dating back to 2002 are here. They seem prone to religious conversions, and speak in strikingly similar terms, notably "I have not particularly lived my life so well, as I never really cared for anyone (not even myself) but my business." So stop and smell the roses. 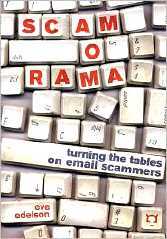 The table shows the name of the scammer, the illness prompting re-evaluation of life choices, time remaining for karmic re-balancing, the sum available, the purpose to which the scammer hopes you will put the imaginary money, and where it can be found. Your ongoing presentation of disturbing demographics leads to only one conclusion : marriage to a 419 scammer is dangerous to public health. And since your statistics confirm that this health risk has gone beyond the boundaries of a single country perhaps the W.H.O. should be asked to take preventive measures. For scam-mavens and scam-o-challenged alike. Please DO NOT contact me if you are trying to take the inventory of my generosity for no good reasons. If you have intention of making away with my money I promise, you would be caught. N:B So sorry for having not contacted you for so long it was due to the fact that i was responding to medical treatment i went for surgery and ever since I came back I couldn't locate you until i finally made it. ... wife of late Mr. Kone Robert; we were married for forty two years ... my husband relatives are evil ... This is why I am taking this decision to entrust this fund to you. Hey Dear, I live at 7, Dennis Lane, Stanmore, Greater London, HA7 4JR which I had placed for sell. I am an orphan and a single lady originated from United States of America. ... because of my poor health, I may not be able to speak with you all the time, but if you must speak with me, the hospital Attorney would assist me... Mark's Hospital London. ... Am glad to have the opportunity to contact you with the laptop the nurse brings for me ... I am married to late Mr William Wilson, a licensed arms dealer and a soldier before he died ... l want to know if your a honest and caring person,because am not used to internet friends. I once asked my lawyer and members of my family to close one of my accounts and distribute the money ... I do not trust them anymore, as they seem not to be contended with what I have left for them. ... I am married to Sir Williams Osborne an English man who is dead ... my husband relatives are bourgeois and very wealthy persons and I do not want my husband hard earned money to be misused ... I do not need any telephone communication in this regard due to my deteriorating health and because of the presence of my husband relatives around me,I do not want them to know about this development. ... the wife of Mr Harold van Gogh,my husband worked with the shell in Netherlands for twenty years before he died ... Because relatives and friends have plundered so much of my wealth since my illness,I cannot live with the agony of entrusting this huge responsibility to any of them. ... I don't need any telephone communication in this regard because of my soundless voice and presence of my husband's relatives around me always. I once asked members of my family to close one of my accounts and distribute the money ... I do not trust them anymore, as they seem not to be contended with what I have left for them. ... my husband relatives are bourgeois and very wealthy persons and I do not want my husband's hard earned money to be misused or invested into ill perceived ventures. I do not need any telephone communication in this regard due to my deteriorating health. elena.maiaowen48@yahoo.com cancerous ailment Though what bothers me most is the stroke my life Spam will not exceed 150days Seventeen Million Seven Hundred Thousand United State Dollars uplift the down-trodden one of the leading security and Finance company in Europe. As-salam Aleikum rahmatullah wa barakatuh. I am Mrs. Amina Yusuf from Island. I am married to Engr. Shaheed Yusuf who worked in oil Company in cote d'ivoire before he died . Though I am very rich, I was never generous ... But now I regret all this as I now know that there is more to life than just wanting to have or make all the money in the world ... So i am looking for a pen-pal friend that will give me words of encouragement because,life is too short for me now to be lonely. I,m a 56 years old man. I am British living in Dubai (United Arab Emirate) ... My wife and two children died in a car accident six years ago. Before this happened my business and concern for making money was all I lived for ... I have found a new desire to assist helpless families.